The UK’s Chief Medical Officer (CMO) has again praised the work of the pig sector in reducing and refining antibiotic use. The NPA sent the latest version of our Antibiotic Stewardship Programme to Dame Sally Davies, after it was updated in the summer. 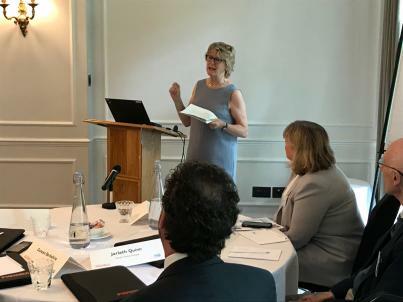 Dame Sally opened the Pig World-AHDB Antibiotic roundtable event in June (pictured), praising the industry for the progress made so far, while stressing there is more to do. “I am proud of how well you are doing with antibiotics You have halved antibiotic use in two years – we are aiming by 2020 to hit 99mg/PCU and we are well on the way. You are also reducing high priority critically important antibiotics, which is very important,” she said.